Why? Well for instance the hard disc is dead - > so we will replace it (and not install a second one beside what one could do by putting a IDE cable with two connectors or better by adding a extra PCI ultra ATA 133 card but that ís another topic). We start by withdrawing all the cables (power supply, screen, keyboard etc). The blue arrow points the new hard disc which we will not leave on the case because we have to remove it. It ës necessary to push on the "buttons" at the places pointed by the yellow arrows. That will release the lid which than can be raised. The "buttons", view from downside, cover removed. Usually I open (in the direction indicated by the blue arrow) the valve pointed by the yellow arrow. What enables me to have more easily access to the two latches pointed by the yellow arrows. They must be pushed towards the centre of the computer. 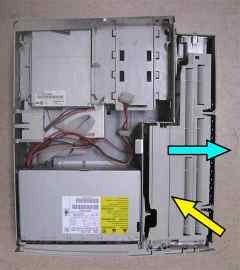 The yellow arrow points the dead hard disc placed on a cradle. 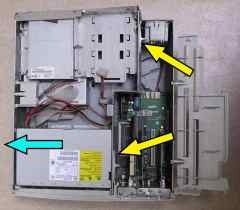 The blue arrow points the IDE cable which should be replaced by a cable with three connectors if one wishes to add a hard disk and not simply replacing it. 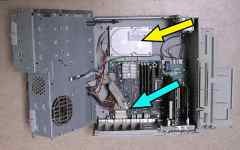 In the event of addition of a hard disc the disc will be placed on a cradle slipped at the place pointed by the yellow arrow, it will be connected to the IDE controller via the new cable, and will be fed by the connector pointed by the blue arrow. As usual, follow the instructions the other way around for putting everything back together!